If you are tired of the same old pokie regurgitated with different themes, bells and whistles and are looking for something new and exciting, then look no further. The boffins at Microgaming have put their heads together to produce a unique and interactive online slot called Castle Builder. This is a new gaming experience unlike anything else on the market. Castle Builder is a five-reel, 15-payline pokie that has a minimum bet (playing all lines) of AUD$0.15 and a maximum bet of $15. That is the only comparison that can be drawn with the other pokies out there in the marketplace. 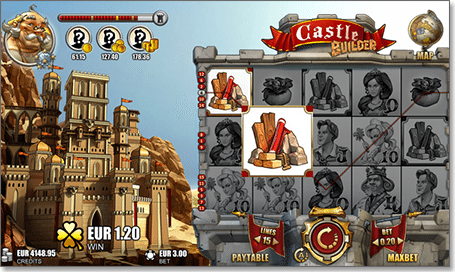 Castle Builder is available to play for free or real money at the trusted online casinos in our table of recommended casinos above. Each of these casinos has safe and trusted methods of deposit and withdrawal. Check each casino review or the sites terms and conditions for their conditions. What sets this online pokie apart? Castle Builder sets itself apart from the pack with its innovative design and unique gameplay. First, Castle Builder isn’t just an online pokie but a progressive storyline where, as the player, you assume the role of a character: The Builder. As The Builder you travel the three lands – Forana, Ethril and Ilrian – of a fictional, medieval kingdom. Each land is ruled by a generous king who hires you to build a castle for one of their seemingly infinite number of sons and daughters. Across the three lands you will have the opportunity to construct more than 30 castles for the three reigning monarchs. Your character, The Builder, also doubles on the playing screen as a wild symbol. Wild symbols do not substitute for construction symbols though. After completing construction of each castle you – as The Builder – are awarded medals and level ups which can result in credit prizes. The game screen is split into two sections. On the right-hand side of the screen is the conventional pokie game where you play and spin the reels. On the left half is an empty field where you will gradually build each castle. Above the empty field, in the top left-hand corner of the screen, is a bar which shows your progress in constructing each castle. Below that bar you will find three cash amounts. These are the three prizes available to choose from upon completion of that particular castle. How does Castle Builder work? Instead of the more traditional pokie domains of bonus symbols or free game features, in Castle Builder it is in the construction of castles that you have the opportunity to win major dollars. So how do you make a castle? Each ruling monarch of each land seems to have around 10 children they are trying to marry off. However, before the king can marry anyone away they must have somewhere to live: a castle. Once you have been assigned a castle to build you can begin the game. By playing the pokie you are aiming to collect as many “construction” symbols from left to right on an active payline as possible. Any two or more construction symbols adds to the castle construction bar and more of the castle itself is built in the vacant lot. Construction pieces not only add to the building of the castle they also add money to three cash prize totals under the bar. These cash totals are the three mystery prizes to choose from upon completion of each castle. Any two construction symbols equates to one standard level on your construction bar. Any three construction symbols on a payline is a bronze level, four construction symbols on a payline is a silver level and five in a row is a gold level. Obviously the more valuable levels add more money to the three possible cash prizes. Once you have completed a castle you are given the option of three suitors for the prince or princess whose castle you have just finished. Each suitor represents one of the cash totals the construction symbols have been contributing to. Once you have clicked on a suitor the cash prize will be revealed. It is easy to pump out another online slot like most others on the market but Microgaming has risen above the easy option and created something new and exciting. We love playing new games and enjoy playing games that have a plot that propels the game forward, making Castle Builder a clear winner from Microgaming. To play Castle Builder for real money at a reputable site, we recommend Royal Vegas Casino, where new players can claim up to $1200 in matched deposit welcome bonuses.